Medical Procedure Creates A Cat-Dog? Buttercup is one lucky feline. He needed a rare xenotransfusion. That is when the blood of one species is transfused to another. Veterinarians at Marathon Veterinary Hospital in South Keys, Florida, performed the procedure on September 16 by giving Buttercup a life-saving transfusion using dog blood. A West Palm Beach dog blood bank provided the life-saving bodily fluid. 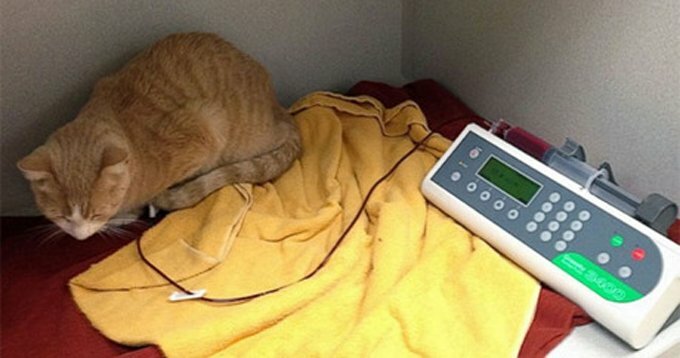 This rare type of blood transfusion allows cats to receive blood from dogs so they can continue to produce new red blood cells. Buttercup’s red blood count was 7 percent, which is incredibly low — thanks to the transfusion, his blood cell count rose to 22 percent. According to Dr. Perry, only 62 cats are known to have had a xenotransfusion. Cats have two types of blood — Type A and Type B, the latter is extremely rare. Cats with Type B often have to receive blood from a dog because it is safer for cell building.